Note: Anyone has full permission to reproduce this FAQ in any form or language in whole or part. Check out WiHerr's OpenGL patch which might fix some graphics problems. The 2004 demo doesn't have this WiHerr update, so if you run in OpenGL, it's recommended to get this patch. **NOTE** For questions not covered here, start another thread at SRMZ or RSC. I'll add to this as I hear of any more FAQ. Thanks to Bazzer for helping out on this. Stefan Roess' site Guides for setting up GPL. Fred Faster's site for advice on graphic upgrades to the original tracks and cars. If you have GPL running well, make a backup copy. If you suddenly have problems, replace your GPL with the backup copy. If that doesn't solve it, there is something else (hardware, virus, drivers, other program running. etc.) causing the problem. you need to create this folder in Windows Explorer (file > new > folder). 2- In the ATI 3D tab, set FSAA to 4X, AF to 8X, Anisotropic to "performance" and Disable Truform. settings in Control Panel > Display > Settings > Advanced > Disable conformant texture clamp. to get that max frame rate is important. Usually at the start of a race, even the highest end system will be as low as 20 - 25 fps but it'll only last for 5 seconds until the cars spread out. There are black bars at the top and bottom of the screen when I'm driving. more of the sky and legs of the driver anyway. set to block transfer. This is no longer the default in the 52.16 drivers. Control Panel > Display > Settings > Advanced > your card tab > OpenGL > Buffer Flipping Mode > use block transfer. 1- If it's one track, there is a file corrupted in the track folder. Either go to the backed up pre-updated folder (you do a backup before EVERY upgrade right?) or re-download and install the track. cars (just the .dat file in the folder) and add back the upgraded cars one at a time making sure that GPL runs after each change. GPL freezes while in an in-game menu. 1- This is sometimes due to a read-only file. There's a utility called CROA which will remove all read-only attributes in a folder. Can't get past the first screen in GPL. 1- Usually you have applied the carsound patch but don't have 7 different car sounds in the sounds folder, in addition to the sound.dat file. The fonts in menus go all fuzzy. switch to the Pitlane or TV2 camera, then go back to the menus. Everything should be readable again. The track menu and replay buttons seem to degrade or melt. 1- This is a problem when using a high FSAA setting with nVidia graphics cards. The in-car, on the track image is not affected. Try lower FSAA or don't worry about it. The anti-aliasing button in the GPL graphics menu is greyed out. 1- That button is only for the original, now obsolete, graphics card that GPL was coded for. You will need to right click on the desktop > properties > settings > advanced to enable FSAA. Changes to the core.ini have no effect. 1- your core.ini.sample file must be renamed to core.ini. Your Explorer > view settings might not allow you to see the full file extensions. UN-CHECK hide file extensions. Cars on the grid of a race disappear then come into view shortly after the race starts. 1- Reduce the Detail Bias in the GPL graphics menu. This usually happens at 100%. 99% is better and 74% is the next level where there is more of an improvement. disappearing graphics the rest of a race should be OK.
Can't view a replay or a red arrow appears. Running GPL in a window, the colours are weird and the buttons are hard to find. 1- To run in a window, you must have the desktop set to 16 bit colour. It seems that in Windows XP, there will be no sound when GPL is open in a window. In the GPL "View Replays" menu, some track names are missing. is unlimited. But having more than 128 track folders causes some track names to not be listed. The replays are listed but the track name is blank. If a track isn't in the tracks folder, replays for that track won't appear in that menu. Frame rate or stuttering problems. 1- This can be due to many things, but the sound card has often been blamed. Make sure you have the latest sound device drivers. If you have a SoundBlaster Live sound card and Windows XP, you should think about changing the sound card. 4- If you're using upgraded graphics for the cars, change to 2D wheels. GPL runs incredibly fast, or at variable speeds. This is becoming a very frequent problem as more computers, expecially laptops, use imbedded power saving features. 2- You need the fast CPU fix from Papyrus (this is for CPUs over about 1.3 GHz, but can be used as a no-CD patch on any speed machine). 3- Laptops have a feature that changes the clock rate of the CPU to match what it thinks you are doing. 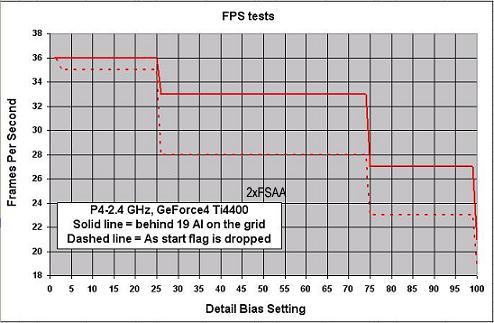 Intel's "SpeedStep" or AMD's "Cool n Quiet"
power options under control panel > power options. See the picture below for settings. Or use the SpeedswitchXP utility. you won't be able to run the 65 mod and possibly future mods. General problems. This can happen immediately, after most cars are drawn or after minutes of driving. 1- Disable the screen saver or power saving settings. components and/or reduce the graphic settings in the GPL graphics menu or the screen resolution or the FSAA to none. service is enabled and "Compress" is disabled. 4- Click on Start > Run > dxdiag to check for video and sound problems. 5- Run GPL without car graphic upgrades, then upgrade one car at a time. use the patches on the CD in the Patches folder. Apply the patches in the order: 1) patch to v.1.2.0.1, 2), D3D patch, 3) fast CPU fix (v.1.2.0.2). or ctrl-alt-del to close all other programs. see if your graphics, sound or network cards share an IRQ number with any other hardware. 10- Upgrade your video card drivers. 11- Upgrade to the latest DirectX version. 12- Changing to Windows XP or upgrading your computer helps. 13- One GPLEA Lotus version needs to have all textures in the mirrors on. 14- It might be a problem with the refresh rate when the resolution changes going to the menus (always at 640x480). HZtool might help. 1- Go to control panel > Game controllers. 2- Click on add > custom. 3- Select wheel or race car controller > 3 axis > Rudder/Pedals > # buttons on your wheel (4 max). Don t check Z axis, it doesn't run. 4- Name your game controller. 5- Click on OK to validate your choice. 6- In the next window, verify controller is connected. 7- Click on properties > parameters > settings. 8- Axis X: steering wheel setting > axis Y: throttle settings > Rudder: brakes settings. 9- Go to test. The rudder bar must be full red. NOTE: on some wheels, the Z axis may work, as this setting is for my SPEEDWAY wheel. In this case check it on step #7 and uncheck Rudder/Pedals. Go inside GPL, you should now have the three axis parameters in black, ready for setting. Calibration - Controller axis missing? Second - When you start GPL, another control.cfg will be created. Third - In the Calibration window run the axes through their ranges. Fourth - Only now can you assign the axes in the GPL game controllers window. way to the right, whereas the separate axes work as normal. Thanks to Tim Nightingale. You might need to use lower values than 0. Multiplayer, VROC, iGOR and the Bandwidth patch. 1- Files have gone missing from the layout folder relating to multiplayer screens. Copy all the original layout files from the GPL CD into this folder. Starting VROC, a message about riched20.dll comes up. 1- Simply delete riched20.dll from the winvroc folder. All red flagged tracks in VROC. 1- Reset the path to GPL. Even if it looks right, direct it to a different folder, then back to sierra\gpl. This is a bug in VROC. Can I race on VROC with a dial-up connection? connections are not good due to variability of the signal. 3- Type 1 > enter x > enter so that you have "more cars patch : applied"
speakers or headphones or mono or stereo and see if that helps. You might also play around with the sample rate conversion quality slider. 2-In the same window try reducing the "Hardware Acceleration" a notch or two. 3-If you're having sound troubles, sometimes newer or older drivers can help. 4-Try using a different in-game screen resolution. Strangely, this fixed sound corruption for me. 6-Thanks to ducwolf - this seems to be the fix for SB Live/XP problems but possibly at the cost of reducing multitasking ability. NT, 2000 and XP, see here. 8-According to Toni Mau it seems that the A3.52 drivers for the AC97 sound chips work best (March 2006). 10-According to Mr. Hitman there are drivers for the ALC850 chipset (nForce mobo's only) which solve sound issues. 11-According to Rodolfo there's an article about crackling sound with Creative X-FI cards. 12-Here's an article on changing the PCI Latency for better sound. 13-Here you'll find a PCI Latency or Disable Turbo Mode patch for SB sound cards. 14-Stefan Roess reports HERE that there's a very interesting utility for all audio devices which might help some sound issues. Sound goes funny after a collision. 1- Upgrade to the latest drivers for your sound card. (found here) or else you'll get distortion. With that driver, you can again select full acceleration in DirectX (run dxdiag.exe)." 5- You can do a Shift+R with the engine at a certain rpm (you'll have to experiment) to clear it up. 7- According to Toni Mau it seems that the A3.52 drivers for the AC97 sound chips work best (March 2006). Sound problems with Windows XP and SoundBlaster Live sound cards. 4- see # 2, 3 and 4 just above. One of these should help, hopefully. Sound problems with SoundBlaster Audigy sound cards. 1- There's a thread HERE where it's pointed out that you might need to disable "Turbo Mode" with the Audigy card and how to do it. That mode can cause sound problems. Computer asks for the CD or says that it's an invalid CD when trying to install or run GPL even though it is in the CD drive. 1- If the problem is after installing, make sure that the v.1.2.0.1, D3D and fast CPU fix patches are applied properly. 2- If you have more than one CD or DVD/CD drive, try all of them. drive letter follows immediately after your last hard disk partition. 4- If you have 2 DVD/CD units try disconnecting or disabling one of them while you install gpl. but to be on the safe side, copy them all over. GPL original demo will not run. can't be patched. Buy the game through Sold-Out Software or elsewhere over the web it is a true bargain. 2- The 2004 GPL Demo here is fully patched and the cars are graphically upgraded, although it only comes with one track, Watkins Glen. It doesn't need any further patches to run. 1- Activemovie and wininet.dll are not required to be installed, just ignore or pass it by. patch after installation. Otherwise you will be told "glide2x.dll and redline.dll is missing"
3- Message: "C:\WINDOWS\SYSTEM32\AUTOEXEC.NT. The system file is not suitable for running MS-DOS and Microsoft Windows applications. Choose Close to terminate the application." 4-You might have one of the following files corrupted or missing due to a Windows upgrade. 1- Try to not use any punctuation or spaces, although usually an underscore __ is OK.
3) Re-create the player with the same name. and control.cfg (or just re calibrate the controls in-game). QUOTE=Runar BjornstadJust had a similar problem and there is a bug that messes up your player. Delete all folder in Players except the one with the right name. 3. Turned on indexing and ran CROA again, which now reported about 100 read-only files. 4. Voila, the driver was saved, everything worked, and I could drop my old player back in the folder and he was then available again. In GPL menus, the mouse is hard to control. 1- This seems to be due to improperly installed graphics card drivers. Uninstall and reinstall according to the instructions from the card manufacturer. Numbers are missing from cars at the start of a race against the AI. 1- You must wait until the red button appears before going to the grid at the start of a race or all the car graphics won't get loaded. 2- The driver.ini file must match the carset since some carsets assign graphics to drivers of that particualr year. Looking for information on How-to, new tracks, utilities for GPL? many other things. A list of all track graphic updates, tracks in progress and more is there, too. 2- The [URL=http://trackdb.d2g.com/? ]GPL Track Database[/URL] has all tracks that have been made for GPL. 1- In your GPL Folder there are two dlls which can be deleted: rast3dfx.dll and renddll.dll. Then GPL won't ask any more for the other dlls. 1- Upgrade your Directx software form Microsoft. 2- Upgrade to the latest drivers for your video card. 3- Use EndItAll or ctrl-alt-del to close all other programs. 4- Excell has reported that this might be related to a faulty stick of RAM or the socket that it's in. Try moving it or swapping in another stick. Can I race GPL with a laptop? 1- Probably on newer ones, but video card and Directx compatibility issues might cause problems, especially with older laptops. 2- In the BIOS, disable the speedstep feature. priority means that it does not interfere with GPL. 5-See also above in post 2 stuttering problems and variable speeds. Where can I buy GPL? and price or Soldout. You are not likely to find it in a store. 2- Check out the Where to buy GPL thread. rights which keeps you from doing some operations like adding GEM and other utilities. go to "control panel" > "user account", select your User account. Now disable "User account control"
Now you can install GEM. you can't install or dis-install some applications..
hasn't been found yet, but it sounds like a graphics driver issue. Sound recorder in vista will not allow you to adjust sound levels. computer (i.e. 32-bit or 64-bit) to your Vista machine. 2. Right-Click the file and choose Run as Administrator. (This is required so that it can write one-time registry entries). 3. Enjoy — from now on you can just double-click that icon and the old app will work! "after the installation of Windows Vista Service Pack 1, VROC is able to ping servers on racelist and I get green flags again."